The Church of Jesus Christ of Latter-day Saints (commonly nicknamed the “Mormon Church” by those of other faiths) has one of the largest women’s organizations in the world. This organization is called Relief Society. This organization was founded in March of 1842 in Nauvoo, Illinois. At this time, the Latter-day Saints were working very hard to build the Nauvoo Temple. The people did not have a great deal of excess goods or money, but everyone made sacrifices to build a temple to God out of the best materials they could afford. Many of the men were volunteering their time and labor. Some of the women wanted to contribute more, so they began to organize a small group to take care of mending, sewing, cooking, and other things to help take care of the men who were working. It was common at the time in the United States for women to form their own societies with by-laws and constitutions. 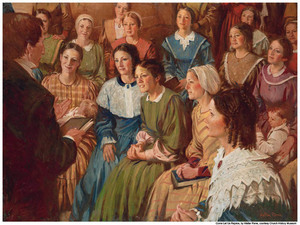 What sets the Relief Society apart from other similar groups is that it was organized by the Prophet Joseph Smith under the authority of the priesthood. “I will organize the women under the priesthood after the pattern of the priesthood. . . . The Church was never perfectly organized until the women were thus organized” (Quoted in Sarah Granger Kimball, “Auto-biography,” Woman’s Exponent, Sept. 1, 1883, p. 51). The history of the Church is not complete without the history of the Relief Society. A new book, entitled Daughters in My Kingdom: The History and Work of Relief Society, chronicles much of this history by sharing personal stories of remarkable women. “This book is not a chronological history, nor is it an attempt to provide a comprehensive view of all that the Relief Society has accomplished. Instead, it provides a historical view of the grand scope of the work of the Relief Society. Through historical accounts, personal experiences, scriptures, and words of latter-day prophets and Relief Society leaders, this book teaches about the responsibilities and opportunities Latter-day Saint women are given in Heavenly Father’s plan of happiness” (Daughters in My Kingdom, “Foreword”). The creators of the book hope that the women who read it will “increase their appreciation for the past and their understanding of their spiritual heritage.” The stories in the book reiterate the eternal truths that women have a divine identity and individual worth as daughter of God. They may look to other women around them, as well as those who came before them, to draw strength and faith from others’ experiences. The book will be a valuable guide for faithful Latter-day Saint women for many years to come. This page was last edited on 3 July 2012, at 11:33.